Imagine watching your favorite sports team, tv show or movie in black and white instead of color. Many of us can remember watching black and white television and the excitement and impact color tv had when that came to our homes. And for those that might be a little younger, use your imagination. That same impact holds true for your printed documents you are sending to your customers. The biggest hurdle for organizations is the cost of color. Now with Tiered Color printing, you can have that impact of color on your documents and save money doing it. You can save money on your color printing with Tiered Color from Copy Systems and Kyocera. 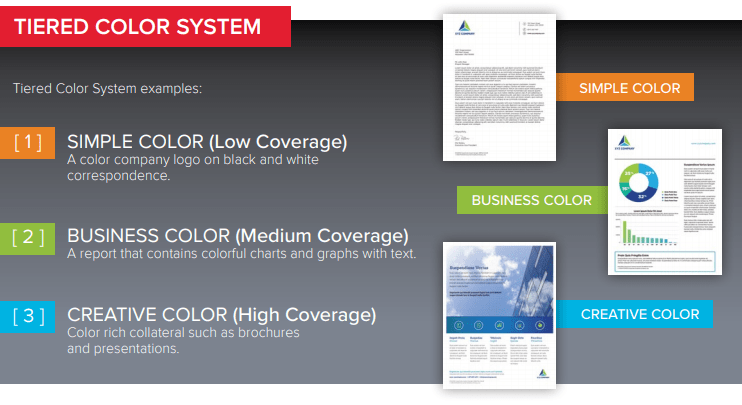 With Kyocera’s Tiered Color System, documents that contain lower levels of color (simple color) can be billed at a lower rate than full color documents. For example, you will be able to print or copy more monochrome documents with your company logo in color, such as letterheads and invoices, at a fraction of the current color cost. Your other business documents at a reasonable middle charge, and only your creative full color documents at the normal rate.